The Verna Ski was developed for ski boats. The design is based on the Vernatone family of inline mufflers. This product line is manufactured for marine use by Centek Industries. 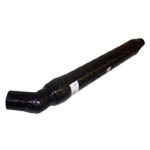 It replaces all Marine Muffler Primex Ski Boat Mufflers, although the length may vary so please be sure this will work in your space.. Also replaces similar OEM Models. For further help see Choosing the Right Muffler, Typical Installation Diagrams, and Vernatone Installation Guidelines. These items normally ship within 24 hours or up to 10 to 15 business days if not in stock.